From its inception, UCI has contributed to the vitality of Orange County by offering access to educational resources and enhancing the achievement of diverse students. In recognition of this commitment to learning, UCI established the Office of Teacher Education in 1971. For 20 years, the unit focused on professional preparation and high-quality training for teachers and administrators. The office later grew to the Department of Education, emphasizing research and graduate study education; and in 2012, UCI's School of Education was established by the UC Regents. The school offers a minor in educational studies, a B.A. in education sciences, a 4-year STEM degree plus teacher credential (in collaboration with the schools of Physical Sciences and Biological Sciences), an M.A. in teaching and a Ph.D. in education. The doctoral program provides students with core knowledge of requisite educational theory and research while allowing them to focus on one or more areas of specialization: learning, cognition and development; educational policy and social context; and language, literacy and technology. The School of Education is committed to promoting educational success and achievement of ethnically and economically diverse learners of all ages through research, teaching and service. The UCI CalTeach program, sponsored by the School of Biological Sciences, the School of Physical Sciences and the School of Education, recruits talented undergraduate math and science majors to prepare for teaching careers. The program enables undergraduates to earn a STEM degree plus a California teaching credential, both in four years. Undergraduates who participate in the program gain experience in inquiry-based science and mathematics teaching through hands-on fieldwork in elementary, middle and high school classrooms. UCI's Master of Arts in Teaching/teacher credential program, the largest in the University of California system, produces approximately 225 single- and multiple-subject preliminary credential recipients each year. The teacher-preparation program combines classroom instruction with research and service opportunities. Additionally, a professional administrative services credential program is offered through UCI Extension. The school's service mission is carried out through community-based programs both inside and outside the classroom. As a natural outgrowth of its credential and degree programs, the school seeks to foster the professional development of local educators and improve K-12 schools. A prime example is the UCI Writing Project, a research-based program that provides in-service opportunities for more than 3,000 teachers in Orange County and the greater Los Angeles area each year. Since 1978, the project has helped more than 8,000 educators improve their writing abilities and techniques for teaching writing to their students. The School of Education partners with multiple community organizations and schools to offer professional development, evaluation services, research opportunities, and faculty and student volunteers. Partners include schools in 28 regional school districts, St. Margaret's Episcopal School, THINK Together, Girls Inc., the UCI Child Development Center and the Tiger Woods Learning Center. Since 2013 the school has provided faculty expertise, teachers and student volunteers to The Academy Charter High School of Santa Ana. Richard Arum is the dean of UCI’s School of Education. Prior to joining UCI, Arum served as chair of the sociology department at New York University. During nearly 16 years at NYU, the professor of sociology and education also chaired the Department of Humanities & Social Sciences in the Professions and served as the Steinhardt School of Education’s director of research. Additionally, Arum served as interim director of NYU’s Institute of Human Development & Social Change. Previously, he was an assistant professor of sociology at the University of Arizona and an instructor in the teacher training program at Holy Names College in Oakland. Arum began his career as a high school teacher and technology consultant in the Oakland public school system. In 2013, the Bill & Melinda Gates Foundation named him senior fellow of its U.S. programs. He is currently president-elect of the American Sociological Association’s sociology of education section. Arum is an expert on the legal and institutional environments of schools, social stratification and digital education. He earned a doctorate in sociology at UC Berkeley, an M.Ed. in teaching & curriculum at Harvard University and a B.A. in political science at Tufts University. The School of Education focuses on six main areas of research: equity of opportunity for ethnically, linguistically and economically diverse learners; teaching and learning in science and math; innovative approaches to literacy, early childhood education and development; out-of-school learning; and interfaces between technology and education. Faculty members include psychologists, sociologists, neuroscientists, economists and linguists. As a result, research projects cross disciplines and investigate topics such as information and communications technologies; cognition in science; race and urban education; educational policy and school reform; program evaluation; reading, language and literacy; arts education; and intelligence theory. Carol Booth Olson's $11 million U.S. Department of Education Innovation Grant to improve academic outcomes for English learners. Greg Duncan's Klaus J. Jacobs Research Prize to test the impact of financial support on children's cognitive development. Mark Warschauer's $3.5 million grant from the U.S. Department of Education's Institute of Education Science to test the effectiveness of visual-syntactic text formatting for improving student achievement in reading, writing and English language arts. Stephanie Reich's $2.9 million grant from NICHD to test the efficacy of using baby books to improve maternal and paternal parenting and child outcomes. In 2015, the School of Education was ranked 31st in the nation by U.S. News & World Report. 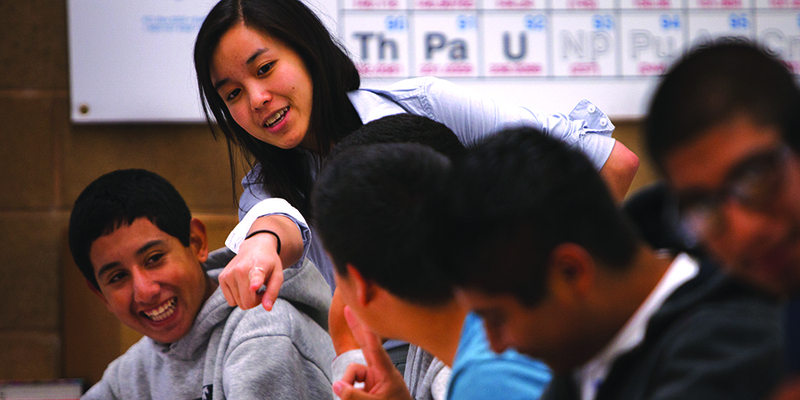 Also in 2015, the school's CalTeach program was ranked 1st in California and the Pacific Region and 8th in the U.S. for undergraduate secondary education by the National Council on Teaching Quality and U.S. News & World Report. Relative to its peers, UCI's School of Education ranks in the top 2 percent in the number of faculty members with grants, the top 1 percent in number of faculty articles published in peer reviewed journals, and the top 1 percent in number of faculty articles cited. Faculty members within the school currently hold $35 million in grants. Four faculty members are members of the National Academy of Education; one is a member of the National Academy of Sciences; and one professor is a fellow of the American Academy of Political and Social Science. Two faculty are UCI distinguished professors, Greg Duncan and Jacquelynne Eccles.